I was talking recently to a student of mine who just completed her first Whole30. We'll call her H. One thing that changed her the most about this challenge was realizing how many foods she could cook and prep herself, rather than buying them at the store. It had never occurred to her that all the things she bought pre-packaged from the grocery store she could actually make herself from scratch. Seems obvious enough, but I recently had a similar "AH-HA" moment myself. I eat a lot of salads. Like a lot. They're easy, quick, and a great way to get in a bunch of veggies. I love raw veggies, but I have limits. A good sauce or dressing is a must if I'm going to eat salad, so needless to say, my fridge has to be stocked with them. I guess I just always thought that salad dressings were born and raised on the grocery shelves, but after talking with H that day, I had a major light bulb moment. 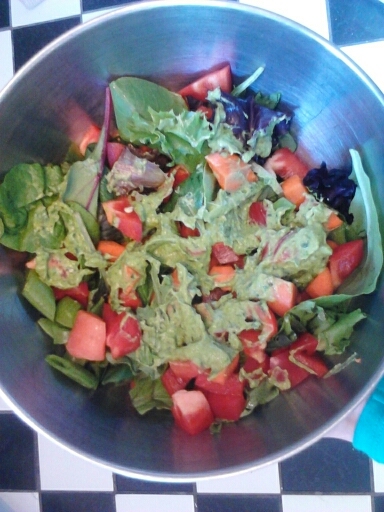 I CAN MAKE MY OWN DRESSINGS!!! I know, probably sooooooo obvious to you guys, but this is big for me. This is especially awesome because even the healthier of store-bought dressings still have sneaky additives and ingredients that we can do without. I've been playing around with some different ones, and here is my fave so far. I hope you can handle this because it's really complicated....toss all these yummies into a blender or food processor and turn it on. Done. You're basically blending up veggies to pour onto more veggies.